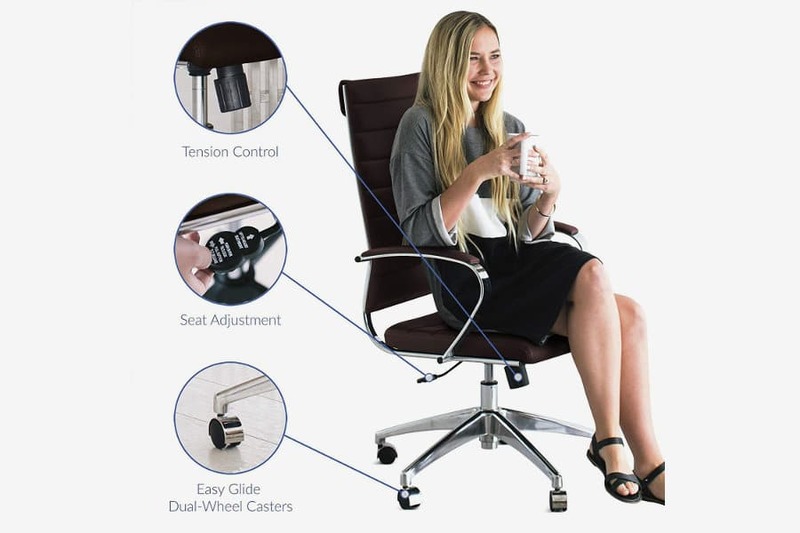 Office life has changed dramatically over the years, and you no longer have to rely on uncomfortable chairs that cause numb legs and knee pain. An ergonomic office chair will make those long 9 to 5 days easier, and you might be surprised at the options available on the market today. We’re dedicated to helping our readers find the best solutions to live a pain-free life, and if you’re in the market for a new chair, we have just the thing for you. 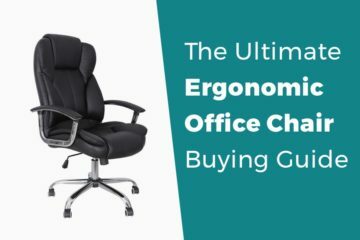 Our office chair buying guide breaks down all the popular styles and key areas which makes things simple when it’s time to buy. The type of job you have may dictate the style of chair you need, which is where we’re going to start. If you’re answering phones all day or work in a call center, you’ll need something comfortable and ergonomic. Whenever you have to sit for long stretches, comfort is critical when you want to keep your mind and legs fresh. This is something I can attest to personally as well. I use a lightweight, ergonomic chair with a mesh back as I write, edit and read for hours on end. Initially, I had a cushier leather chair which was more comfortable overall, but not suited for longer stretches at the keyboard. 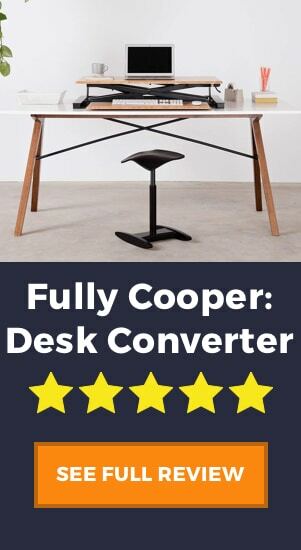 On the flipside, you may just need a simple replacement for your creaky cubicle chair or something suitable for part-time work. It all comes down to your needs in the end, and budget in some cases unless it’s on the company’s dime and you carte blanche to choose any office chair you wish. 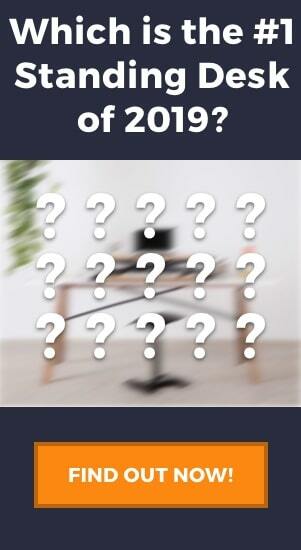 There are well over a dozen different styles of office chairs, but we’re going to focus on a select few. These are the most common styles of office chairs you’ll find in businesses around the globe and suit everything from the boardroom to a home office in the corner of your bedroom. An ergonomic office chair is one that can adapt to your dimensions. Ergonomic chairs are by far the most popular style of office chair, and technically any chair can be “deemed” ergonomic by the manufacturer. Whether it’s a marketing tactic or actually conforms to your body varies, but is easy to figure out once you know what to look for. 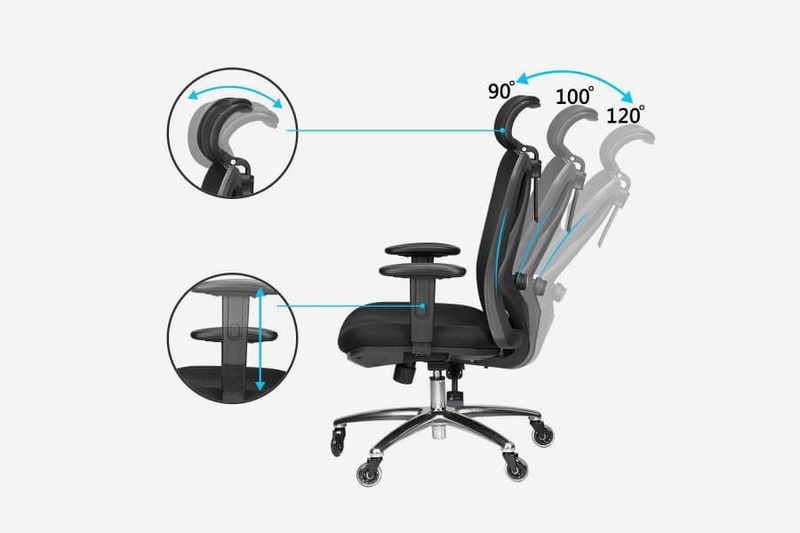 An ergonomic office chair allows you to adjust all the important areas including the armrests, seat height, depth, and seat angle in some cases. You can also find lumbar support on this style of chair more often than not, and many computer chairs fall into this class as well. 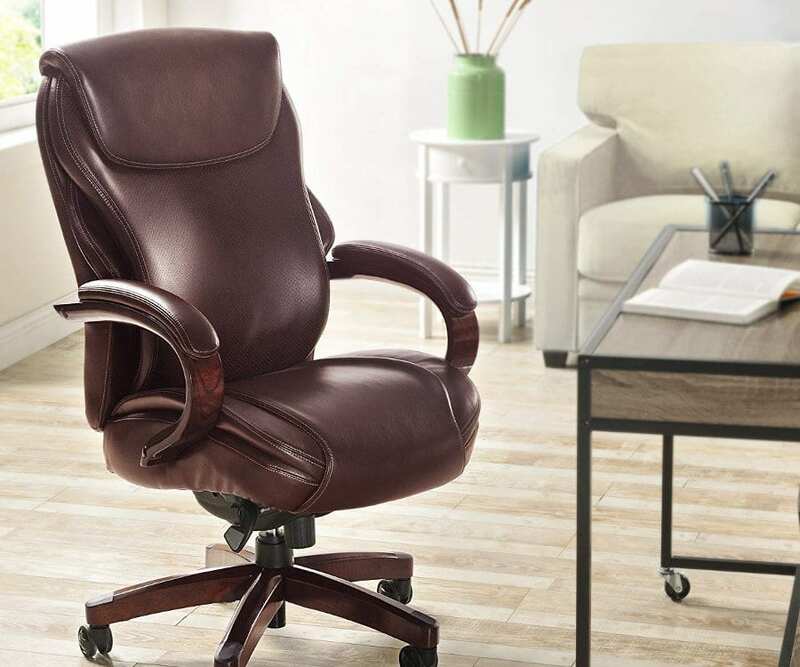 Whether you’re the boss or just want something large and cushy, an executive model chair is an ideal choice. These chairs are usually covered in leather with high backs and plenty of cushioning where it counts. 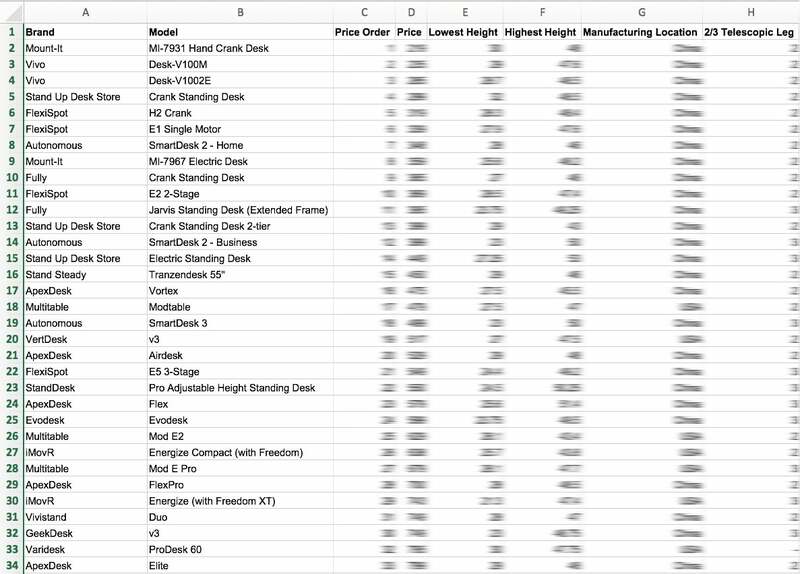 You can also find models with wood bases instead of metal if you want an office chair with an old world feel. A tall back office chair is necessary for proper back support for taller people. Keeping comfortable is key at work, but difficult if you’re 6’ 4” and sitting in a chair built for normal-sized folks. Thankfully, they make “big and tall” chairs that are roomy enough to accommodate consumers the size of an NFL lineman or people that have to duck going through doorways. These office chairs aren’t meant for use at desks but are the only option when you deal with staff meetings on a regular basis. Conference chairs are designed to lean forward and keep you attentive for short periods of time. They are comfortable for a few hours, but not something you would want to sit in all day. This is a term companies tend to use loosely as there aren’t too many professions we are aware of where you’ll sit for a 24-hour stretch. Call centers are an exception, which is one place you’ll find this chair in use. While not as comfortable as an ergonomic or executive chair, they are built to last with lots of padding and durable parts. BOSU Ball chairs are great for developing core strength. If you work from home or in one of those “fun” offices where dogs roam the halls and dress codes are unheard of, you may want to think outside the box when it comes to office seating. 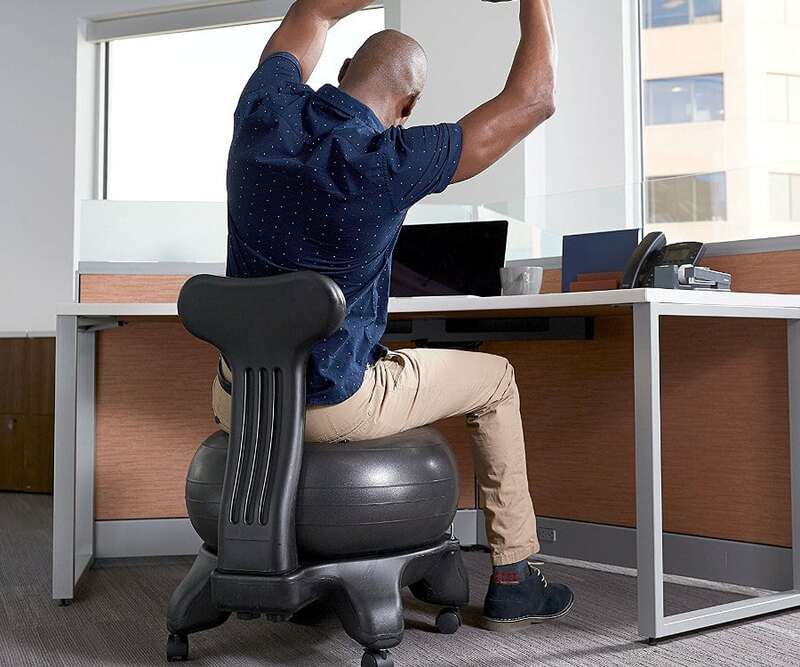 BOSU ball chairs are not for everyone but are certainly an intriguing option over the traditional office chair. Instead of a seat, there’s an exercise ball in the middle which is said to help with posture while strengthening your core. If you would rather kneel than sit, there’s an option for you as well. Kneeling chairs are still relatively new on the scene, but alleviate back pain by disturbing your weight in a different fashion. Saddle chairs and learning stools are two more interesting alternatives that stand out but are an acquired taste. The last type of chair we want to touch isn’t for working at all, but for guests stepping into an office or employees sitting down with the boss. Lobby or waiting room chairs come in all shapes and sizes whether you need something simple and cheap or a leather lounger from Salto + Sigsgaard that’s worthy of the U.N.
Once you figure out what type of chair you’re looking for, it’s time to focus on areas like the seat, arms, wheels. Those are components you’ll find on every office chair regardless of its style although far from the only parts you’ll need to remember. Make sure to choose a chair with all the correct features. Every modern office or desk chair I’ve used has had wheels. It’s a common feature, but a bad wheel can do your day in quickly. Caster wheels are whether you’re on carpet or hard flooring although you’ll want non-marring caster wheels for hardwood and tile. This is another part almost every chair will have aside from a few exotic exceptions. There are two different styles of armrests with fixed and sliding arms. The former are self-explanatory, but sliding arms can go one of two ways. Chairs that allow you to raise your armrests up are easy to find, and it’s a feature we highly recommend. Office chairs with fully adjustable arms are a little rarer, especially if you want ones go forwards, backward and slide out at the sides. Like to rock a bit in your office chair? That’s not a problem when you’ve got tilt and tension control. Simply put, there are a series of knobs that allow you to set the back angle and lock it in. All the top options will have a form of tilt control, and it’s not a feature that should be overlooked. The back of your office chair is arguably the most important part. This is where lumbar support comes into play along with the aforementioned tilt controls. You obviously want a chair that provides you with the proper amount of support, but the height of the back is critical if you want full support for your upper back, neck, and shoulders. If you’ve ever seen a chair leg break, you know already know how important the base is. In the office chair world, you don’t have four sticks to worry about however as they all have a similar design. You’ll still want to pay close attention to what the base is made from, and aluminum or steel should be at the top of your list. An office chair with a thin cushion can absolutely ruin your day, but so can one that’s too small or flat. Thankfully, it’s the one area you can alter on any chair considering they make cushions, beaded mats, and gel-infused solutions that can keep you comfy a cool throughout the day. 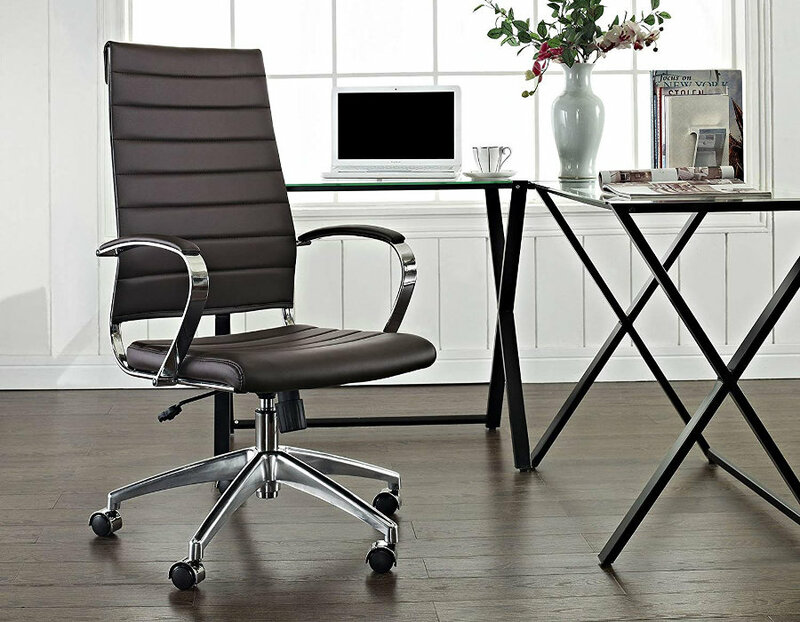 While not as important as comfort, style should not be overlooked when you’re shopping for the best office chair. It may actually be the first thing you need to consider depending on your office and any requirements they have in place. If you work at a youthful company that allows its employees to get creative with their décor, the world is your oyster when it comes to style. Whether you want a furry pink office chair or a large high back chair that can hold two people, there is an option out there for you. That includes consumers that just need something easy on the eyes, affordable and more in line with classic office chairs. You’ll be amazed how nice a titanium finish looks against black mesh, especially when the chair has a modern vibe. While you don’t need to carry around a yardstick, you will want to keep the overall dimensions of the chair in mind. If you have an office of your own, space may not be an issue but workers that spend most of their time in cubicles may need something smaller and more maneuverable – especially if you split the space. Sometimes, more than anything, the style is the most important feature. If pink furry chairs aren’t your thing, you’ll be pleased to know you can also choose from other types of fabric as well. Leather is an option along with mesh, but each material has their pros and cons which we’ll highlight below. When you want something luxurious that will make your coworkers envious, leather is the only way to go. It’s soft, will hold up longer than cloth but tends to be more expensive unless you go the pleather route. You’ll also need to condition your seat occasionally, or it will crack just like a car seat or couch. A good mesh chair is made from materials that let the air flow and will keep you cool at your desk. While most provide a great deal of support, they can be lacking in other areas including the cushion where you’ll place your rear. 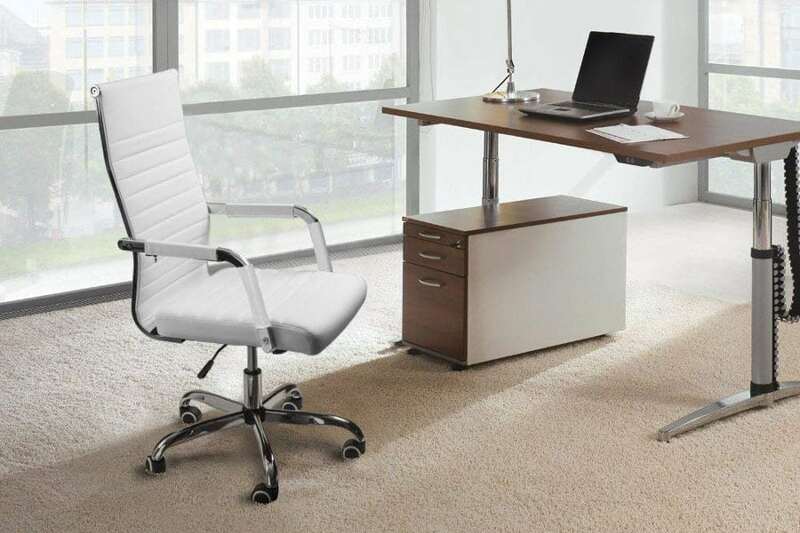 If the office chair isn’t covered in leather or mesh, it’s usually has a blend of other materials covering the seat and back. Cheaper office chairs use this material, but the fabric can wear thin quickly and will soak up spills like a sponge. Office chairs are like any other product as they come with a warranty. Just how long you get can vary from a mere 30-days to 5-years or more as it comes down to the manufacturer and the quality of the chair in general. A warranty is definitely important although a shorter one shouldn’t completely rule a product out if it’s built well and the company offers replacement parts. As for those parts, we found wheels and common, and you can pick up a new gas cylinder for the lift without breaking the bank. Armrests are a little harder to match, and if the cushion goes, it’s usually time to replace the entire chair. 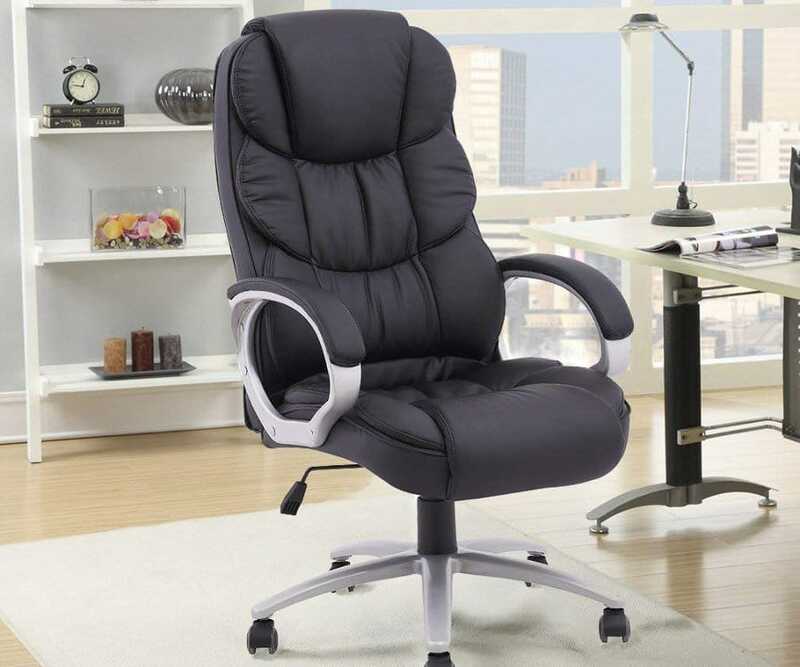 While lumbar support is a popular option, some office chairs can do more than that. Vibration and heat are more common than you think but typically only found on larger chairs or ones geared towards gamers. Want a chair with a little more suspension than most? Well, it’s tough to beat the racing suspension spring found on the sleek PitStop LXE. That may be overkill for some, but proves our point that there is a chair out there for everyone. A great office chair is something that will pay for itself quickly– as your productivity goes up, your paycheck may follow. They can also lessen the load taken by your body from sitting for hours behind your desk. Finding the right one doesn’t have to be difficult either; just keep our tips and your budget in mind, you’ll find the perfect chair in no time!